We agreed to host some special Project by Pj Library in our house. 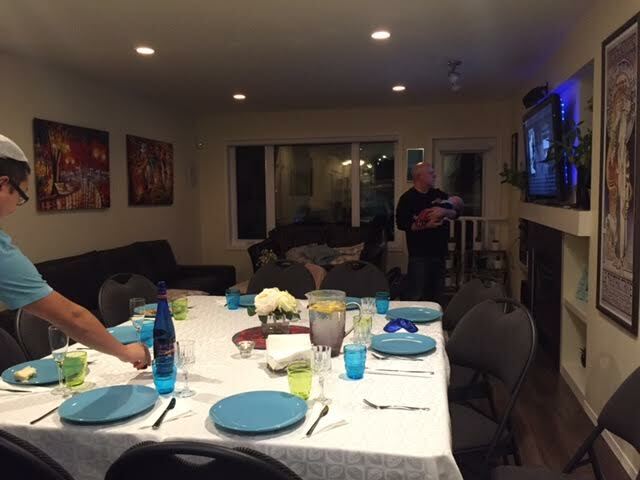 The second dinner was a week ago, the Pj Library Shabbat in the Neighborhood project is about to connect some Jewish families that you don’t know yet who live closer to you to come to your house for Shabbat Celebrations closer to Jewish Holidays. 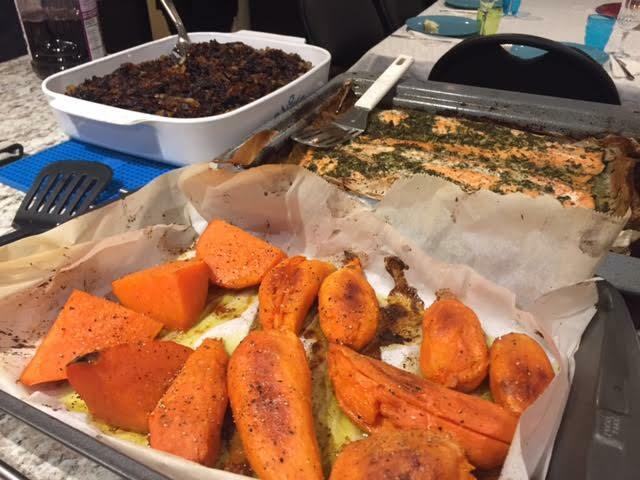 We had one on Sukkot where I served Kosher Chicken and this one I wanted to serve dairy products in the dessert time so I decided to prepare fish. I asked one of the families inviteded if they liked fish and they said yes, the other family, I totally forgot because we were getting together more often and I did not pay attention on sharing the menu with them. When you become friend you assume everthying will be fine… Anyway, Alissa’s family are Canadians who grew up here and Hagit family is from Israel so I thought to prepare a inspired “Middle Eastern” recipe to please both of them. 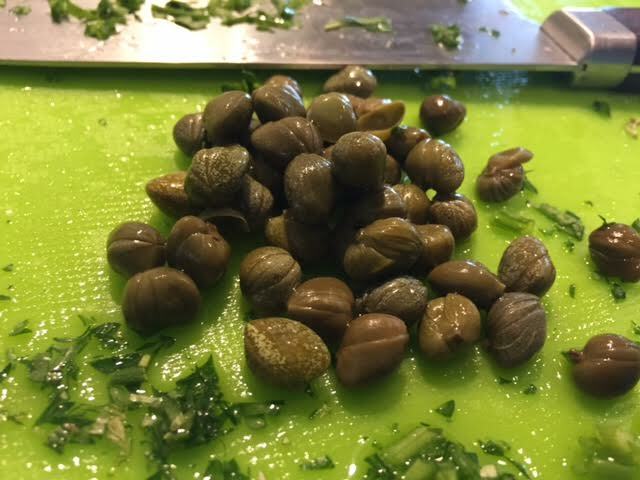 I ate Middle Eastern Mejadra when I was a kid, in Brazil we have lots of Lebanese restaurants that serve amazing food but not many Israeli restaurants. 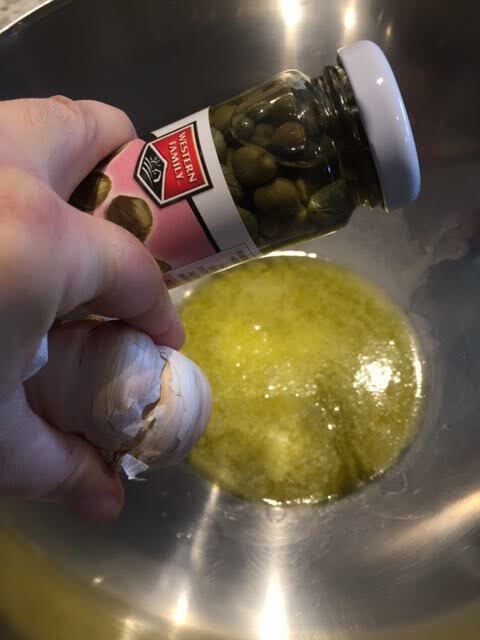 The good thing is that “Middle Eastern” food share many of the same ingredients and traditions and I grew up eating Lebanese rice and lentils and when I arrived in Canada I discovered the proper name of that dish that is Mejadra. I got a beautiful Israeli Book from my friend Brenda that explained a bit about this dish. 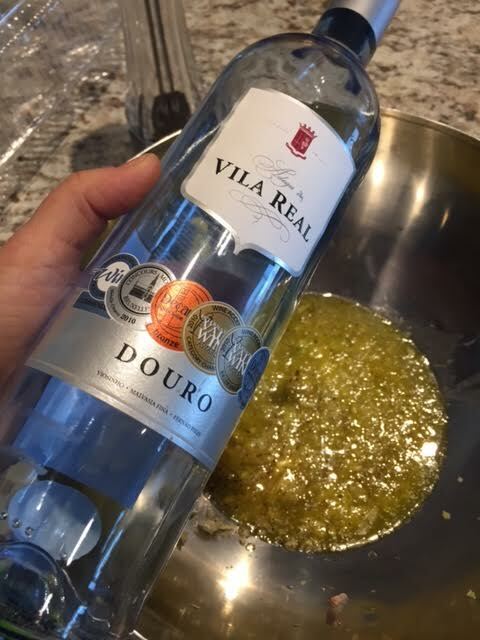 So I developed a different recipe for my flavor, not exactly the one you will eat in Israel or Lebanon. The Trout and Mejadra I served with Roasted Sweet potatoes and Alissa sent me a message days after asking for that recipe, she told me her family got the trout and now she wanted to reproduce the same recipe. 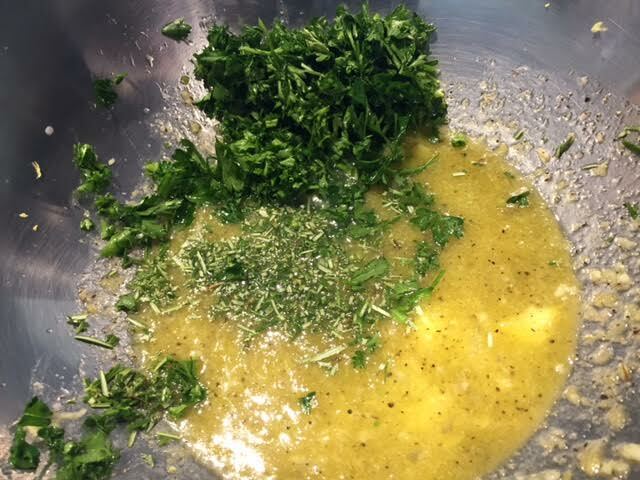 Funny that most of my recipes in this blog are a request from whom ate my food! That is a good sign! And one interesting fact is that Hagit hated fish, I forgot to ask this very important detail! But guess what ? She ate the trout to the end, than told me she did not tolerate the smell of fish or anything that looks like fish, but she was able to like this one. I guess I created a recipe that converted her to eat some fish, at least in my house…or in her house, because I will share this recipe with her too. 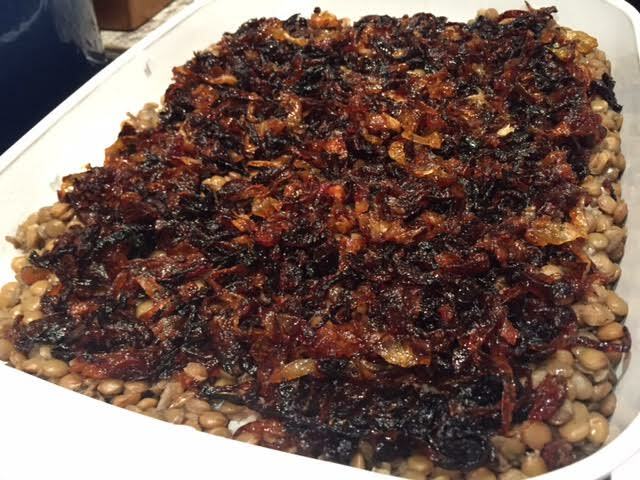 2 cups of dried lentils soaked for 2 hours in 1 liter of water. 7 big yellow onions sliced thin. Wash the jasmine rice and Put the 3 cups inside the Rice cooker and complete with cold filtrated water until the correct level for 3 cups and click on “Plain Rice” will be done in 40 min and leave there on automatic warm function. 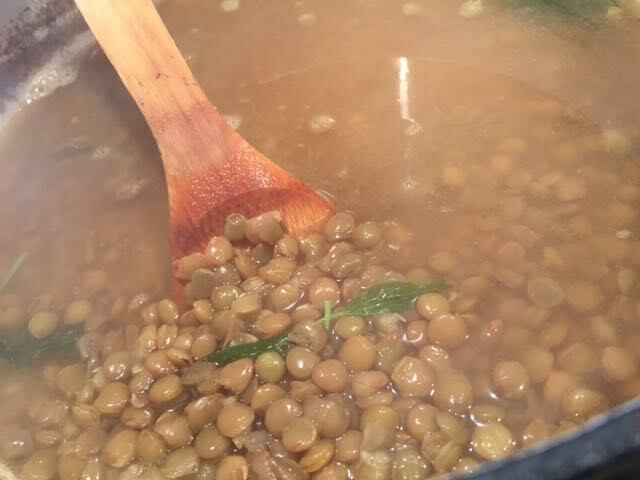 Than get the lentils that rested in the water and put everything, including the water in a pan and add the vegetable broth to it, add the curry powder, the salt, the basil and bay leaves. Cover the pan and cook in low heat once it boils for about 50 min or until the lentils are soft. I kept in the stove to warm but we have a professional gas stove that you can leave pans in a very small and low flame. If you don’t have that option, just turn off the stove and once everything is ready you heat up again before serve it. 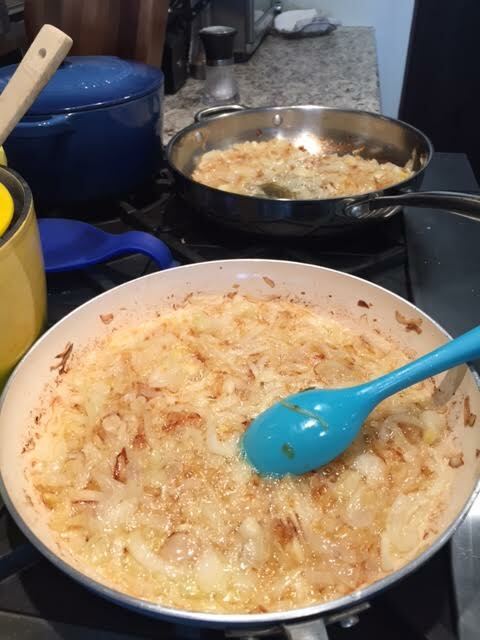 Get 2 pan to fry the onions. This step takes time and patience. 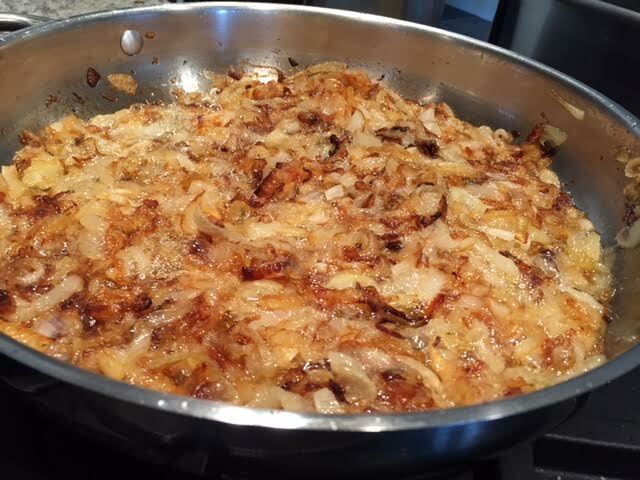 You will not caramelized onions in less than 45 min. 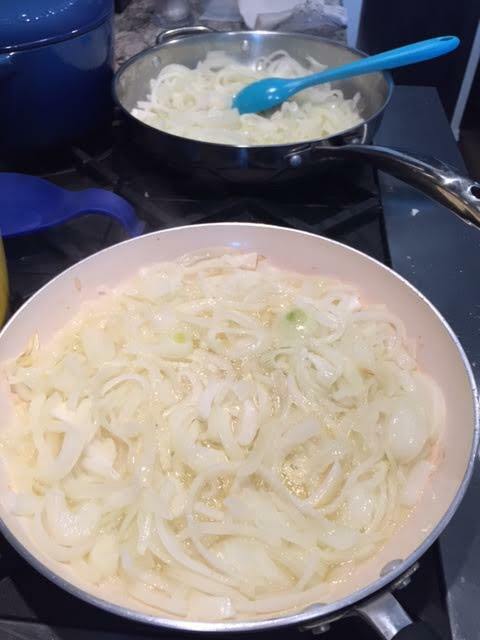 You will divide 1/2 cup of olive oil in 2 pans and put equal portions of sliced onions on it. Fry and keep your eyes on it in low heat. You might need to come once in a while to mix to not burn . It will take 45 minutes to be brown and caramelized. I added photos to show 3 steps, while, medium brown and the brown that should be ready to serve. 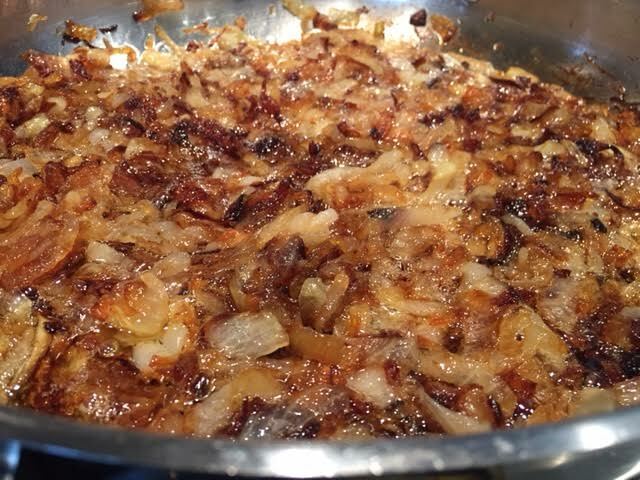 The secret of this Mejadra is the caramelized onions, do not get anxious and remove when it is not brown. Once everything is warm and ready in a serving container place the rice in the bottom, the lentils on top and the onions on top of everything. I did not find a person who did not love this dish. 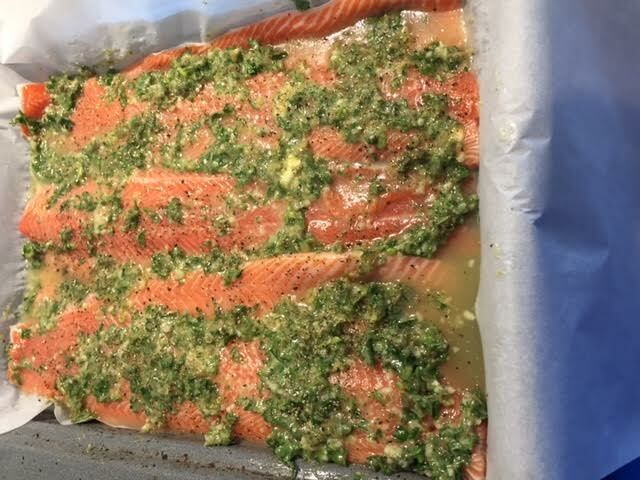 In the Large rectangle baking tray put the paper, a very long piece in order to completely wrap your 3 trouts. 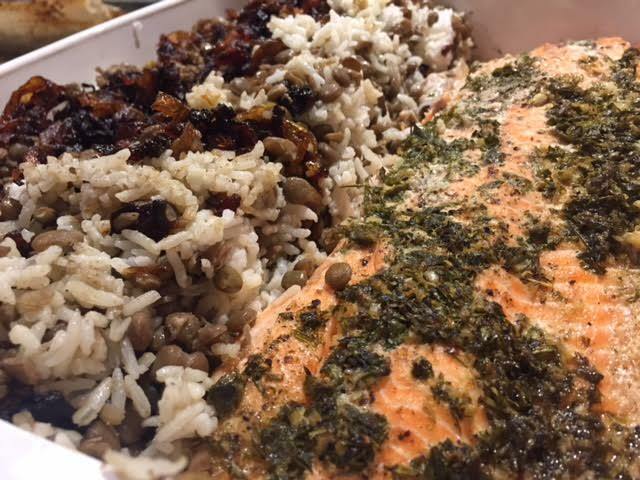 Than Add the trouts on top and all the marinate you prepared. Wrap the 3 fishes and put back in the fridge for 3 hours at least, I did this step around 1 pm and by 5 pm I started cooking. 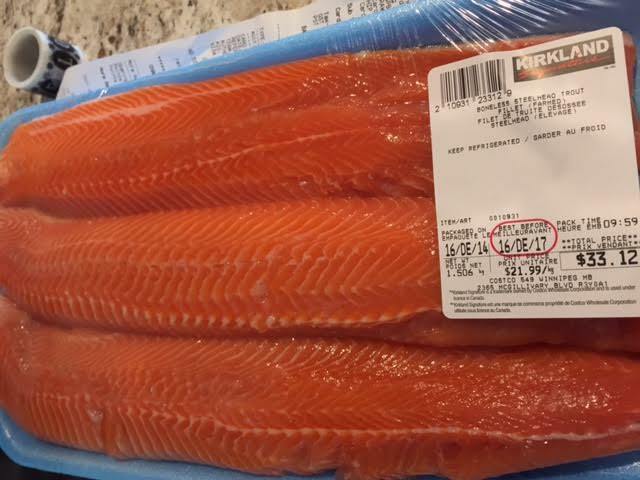 After the marinated penetrated well with the paper ON pre heat the oven to 300 F and leave there for 45 minutes than cut the wrap part from the top , make sure all your fish is exposed this time and Broil ( if you don’t have Broil function increase to 400 F) for 15 extra minutes. It is ready to eat! Easy and good. For the roasted Sweet potatoes, put the 5 whole sweet potatoes with skin in a square baking tray with Parchment paper under them for one hour and 1/2 on pre heated oven to 350 F. When it is ready, remove the skin and cut in half, add kosher salt and pepper on top, spray some olive oil or canola oil on the potatoes and put back in the Oven for broil for extra 10 minutes. 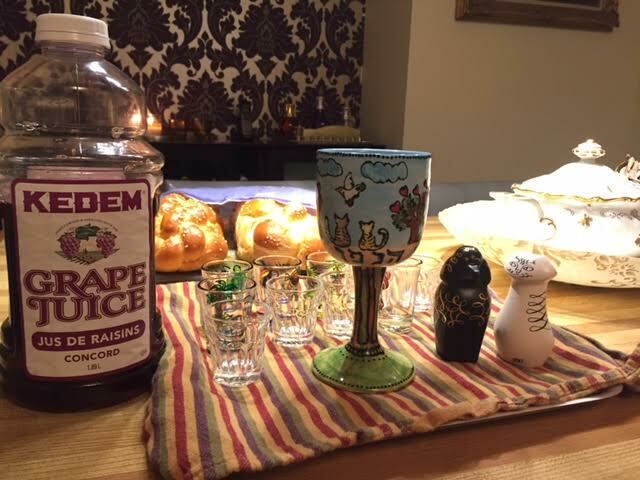 The PJ library shabbat dinner it is ready to serve !